This tab provides the desktop configuration. The basic and most favorite is changing the desktop background. On low performance computers, the loading of a background formed by a larger picture can slow down the start of the computer. When logging in to a network where the user profiles are saved to the server, such background could cause a higher load of the network and slower logging in. Information about different ways of using a picture as background you will find in the Changing the desktop background article. In the Background tab you can choose from backgrounds supplied with Windows (stored in %SystemRoot%\Web\Wallpaper or %SystemRoot%). You can also use the Browse button to search for a picture or an Internet page on your disk. Position - here you will find options for selecting an image to be used as wallpaper or to be used with a pattern. 1. Stretch - stretches the picture over the screen - reduces or enlarges the picture so that it fits the screen (there is a disadvantage: the picture may not always have the most convenient format and so it can be deformed after it is stretched over the screen). Advantage of this option is the absence of disturbing picture edges. 2. Tile - tiles the whole screen with a smaller picture copied one beside another. If you choose a photo or a similar picture to be tiled, you will always see the disturbing picture edges on the desktop (similar to common floor tiles and the joints between them). 3. Center - places the picture to the center of the screen. If the picture is smaller than the screen, the rest of the screen will be filled with a chosen color. Color - allows you to choose colors for your desktop. This option may be important for you if you have no picture on the desktop or you use the Center position. General - activates or deactivates the presence of basic system icons, enables easily to change these icons. Run Desktop Cleanup.. runs a wizard that helps you to remove icons that you do not use. Creating shortcut, changing icon, shortcut for running a program. Web - allows you to enable or disable using the active desktop. If you wish to have your favorite web page or a html file saved on the disk to be set up as your desktop background, you can have it. Many users use this way to save their initial pages or their own webs onto the local disk. Active desktop - selected pages will be displayed on the desktop in one or several windows. After pointing the cursor onto the upper edge, the header with several options will be displayed. The header is not displayed in case you use the Lock desktop items option. Lock desktop items - locks sizes and positions of the items on the active desktop. The default setup of each item is to be displayed in a small window - locking is not recommended. The Themes represent files containing preset properties of the appearance and the behavior of Windows. What the themes can change? - Desktop, icons, appearance of windows, font types and sizes, screen saver,..., sounds and mouse pointers. The new standard environment which is now rounded and colorful you will find under the "Windows XP" theme. Older but classic theme of Windows 2000 is under "Windows classic" theme name. If you have done some changes in the current theme and you want to keep these changes, choose Save as... If you switch to other theme, all unsaved changes will be lost. You could use themes already in Windows 9x after buying and installing the Pluspack service pack. Themes from this pack can also be used in Windows XP - some immediately and some after little adjustments. Demanding users will appreciate freeware theme collections on CDs or in Internet. 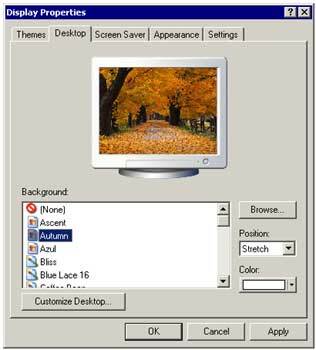 We have dedicated the Using the Themes article to the themes for Windows 2000. If you choose More themes online, you will be linked to a Microsoft´s product called Microsoft Plus for Windows XP which contains other themes and some other multimedia tools. Older bookkeeping programs and text editors used to run several hours a day on the screens which could negatively affect the screen in several years - the program's image was burned into the screen. Although the new monitors are far less sensitive to this effect, it is recommended that you use a screen saver in combination with other economic features of your monitor and computer. In the Screen Saver tab you can select the type of your screen saver, you can use the customize settings and set up the period of inactivity after which the screen saver will be activated. In order to enhance the security, you can enable the requirement for entering password after restoring the activity. You can download new screen savers from Internet or buy them as a collection of screen savers and themes on a CD. The screen saver itself is usually stored as a *.scr file in the %SystemRoot%\system32 directory. When transferring screen savers between computers, just copy the appropriate file. Some screen savers may be formed of several files. Most screen savers are not designed for a certain operating system and so can be used on both Windows 9x and Windows XP. Settings for computer's economic features. More in the Power management article. The Monitor power tab can be opened by writing the control color command in the command line or in the "Run" menu. There can be computer viruses hidden behind the offers of screen savers, especially in e-mails! Appearance settings for particular windows and effects. It serves for creating and adjusting themes. 1. Windows and buttons - enables to switch between different styles of displaying windows and buttons. You can choose the classic display known from older versions of Windows or the new rounded Windows XP style (the picture above is displayed in the Windows Classic Style with a preview of the Windows XP style). 2. Color schemes - preset color schemes used for changing colors in windows. The range of color schemes depends on the chosen window style - there are only 3 color schemes for Windows XP, but more than 20 for the Windows Classic Style. 3. Font size - this option is used to change the system fonts´ sizes in case you do not want to change the resolution in order to get better font legibility. Visual effects for menus, icons and fonts - important for the visual appearance. You can speed up the system if you disable some of the options here. This tab also provides an option for smoothing fonts for LCDs. Transition effects - defines whether there will be used animations for local menus and buttons. 1. None (the box unchecked) - fast displaying of the local menu. The animations are needless for those who prefer saving time to visual effects. 2. Scroll effect - the menus slide into the view. 3. Fade effect - the menus fade from the desktop. Use large icons - enlarges the icons (c. 50%) on the desktop and in the Start menu. Show shadows under menus - the local menus leaves shadows behind and creates the 3D effect. Applications, windows and other objects are not supported for this feature. Show window contents while dragging - defines whether there will be the window content displayed when dragging or changing the size of a window. If you leave this check box unchecked, only the outlines of the window will appear and the content will be displayed when the dragging or changing size is finished. Hide underlined letters for keyboard navigation until I press the Alt key - until you press the Alt key, there will not be the underlined letters of shortcuts displayed in the menus .